The folks at Nintendo have announced (finally!) 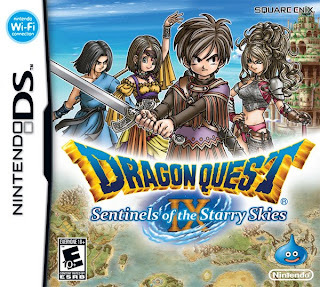 European and North American release dates for the eagerly anticipated Square Enix/Level-5 RPG, Dragon Quest IX: Sentinels of the Starry Skies. North Americans will be able to get their grubby little hands on the DS title on July 11, while their European counterparts will be able to do so on July 23. 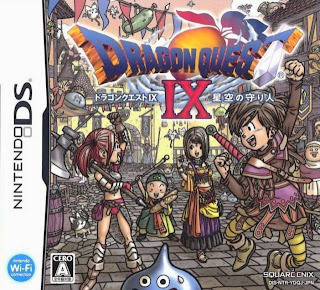 Although the European and North American versions of the game will retain most, if not all, of the features and qualities that made the Japanese original a mammoth hit, they will not retain that version's cover art (below). Which do I prefer? Eh, the Japanese version, I guess, although I can understand why the brass at Nintendo of America/Europe decided to change it (i.e., they probably considered the original art a bit too "Japanese" for Western audiences). 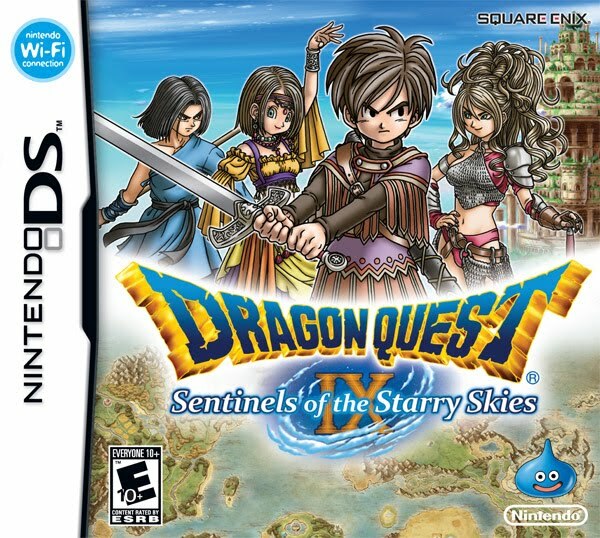 Anyway, if you want to know more about the European and North American versions of Dragon Quest IX: Sentinels of the Starry Skies, head over to tinycartridge.com or toastyfrog.com. Or just click on this link to see the game's latest trailer. I don't particularly enjoy either box's art. The Japanese version seems to do little to represent the game, and the US version is so "generic RPG box art" that it doesn't make an impact. Second one is too cliche for my taste, I like the first one. I will have to agree with Luminairis. With the first one it looks like they could be doing anything -THE POSSIBILITIES ARE ENDLESS! Like the Brown-Hair-Goku is like, "Yeah let's have a sandwich party!" Then the red hair lady is like, "Hell yeah! I will cut the meat with mah axe!" Then the woman in the dress is like "I will dance and do other useless things 'cause I don't cook!" Then the little guy is "I got the bread!" Then the cucumber at the top is hiding from them and willing to fight to the death because he doesn't want to be turned into a sandwich. Just to prove that more glam can sometimes be good. It tells more of a store than four people standing above the logo. I don't like the Japanese version's cover art. The colors seem pretty washed out for what seems intended to be a jovial scene, and I have no idea what these goofballs are celebrating in the middle of the street about! The main guy on the right looks particularly goofy; I've never seen someone express their delight about something with such an awkward leap for joy (and he's doing it in public, no less). The American version's cover is indeed pretty typical in that it's taking these little cartoony characters and trying to make them look like badasses while striking "cool" poses. I think it pulls off the cliche well enough, though, and I like most of the color choices they made. The main guy is again the lowlight, though.